Low Carb Mini Cheesecakes boast a rich and creamy filling on top of a flavorful walnut crust. 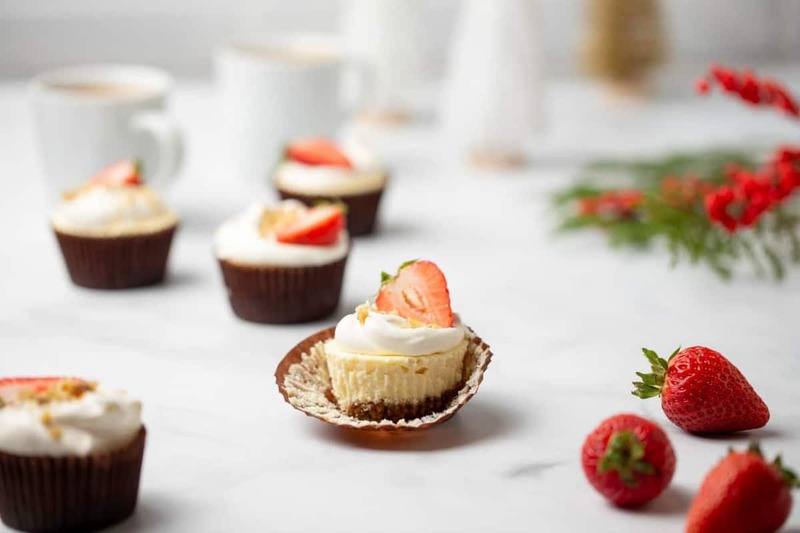 These mini cheesecakes are so good, you won’t even realize they’re low carb! This post is sponsored by Fisher®. Thank you for continuing to support the brands that make My Baking Addiction possible. I love this time of year for a lot of reasons. The baked goods, the family Polar Express rides, cozying up by the fire in holiday PJs with a cup of hot cocoa, and of course the Christmas trees. You read that right, I said trees. As in more than one. I grew up with a flocked tree at my Nana’s house, so I always love getting a flocked tree. I keep a “fancy” tree, as well as less fancy tree with all of Elle’s ornaments. And this year Elle got her own 6-food sparkly white tree in her room full of loads of glittery pink ornaments. Yes, we have 3 trees this year and I want more. There’s just really nothing better than snuggling in the dark by a lit Christmas tree, maybe munching on something you baked earlier in the day. 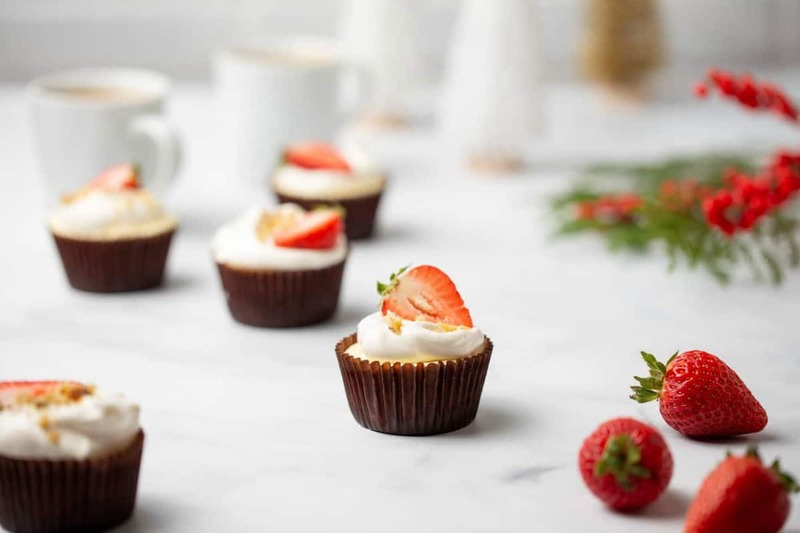 In fact, I could say that I like to make mini desserts during the holidays for parties and entertaining. But secretly I like mini desserts at the holidays because they’re easier to snack on at night while you admire the Christmas tree. 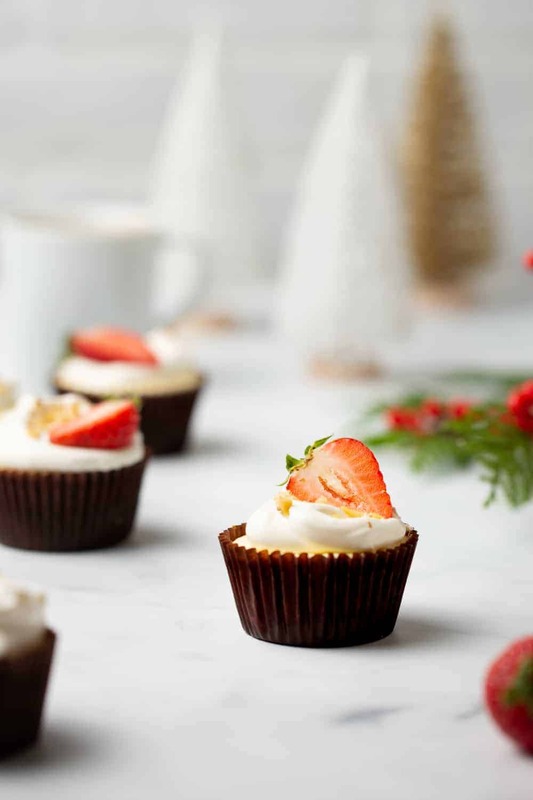 Whether its Chocolate Peppermint Mini Bundt Cakes or these Low Carb Mini Cheesecakes, personal-sized baked goods are my jam this time of year. In case you were wondering, running a baking website can take a bit of a toll on one’s diet. I do taste everything I make, so when I’m not testing recipes I try to watch my carb intake. Ya know, because life is all about balance. Luckily for me, cheesecake is not too hard to make fit a low carb diet. I say luckily for me because if you’ve been around here for any time at all, you’ll know that cheesecake recipes are some of my favorite things to make. Of course I could make a low carb cheesecake without a crust, but let’s be honest – that’s not flying in my family. We love a good crust way too much for that nonsense. So instead I turned to my favorite Fisher® walnuts to help me make a low carb cheesecake crust that is not just flavorful, it might just become a regular stand-in for the more traditional graham cracker crust. 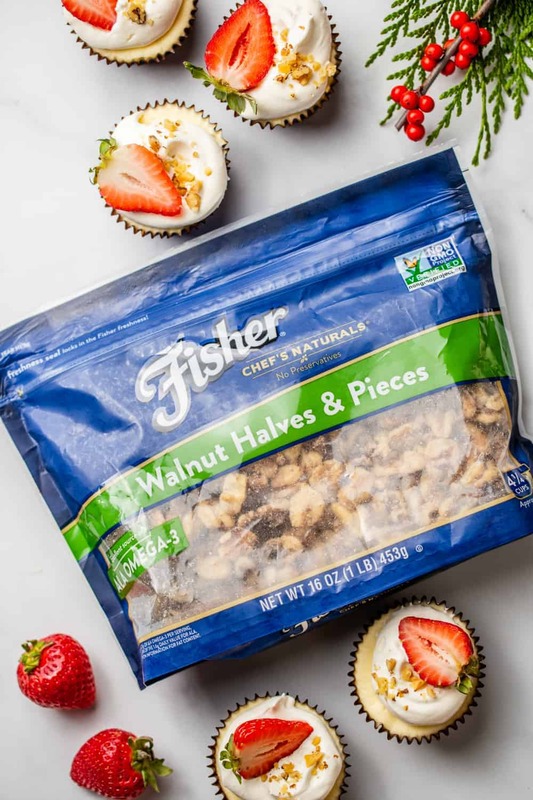 Of course I chose to use Fisher® walnuts because they are fresh right out of their shells, have no preservatives and are non-GMO Project Verified. They’re simply the best! I already love using pecans and walnuts in holiday dishes such as Chai Spiced Candied Pecans, Caramel Pecan Clusters, and Sausage Cheese Balls. And in these Low Carb Mini Cheesecakes, Fisher® walnuts add the perfect texture and flavor to the low carb cheesecake crust. 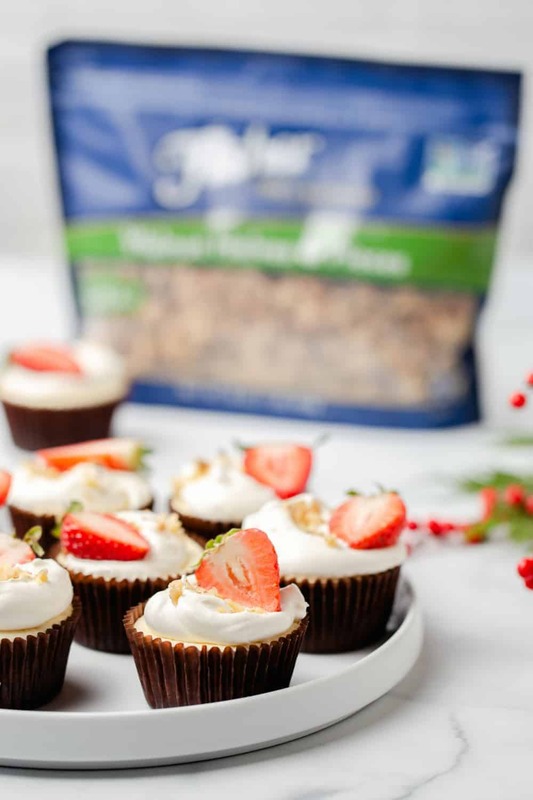 Not to mention that walnuts are packed full of Omega-3s, and the Fisher® stand-up, resealable packaging keeps the nuts fresh for longer so I can add those heart-healthy walnuts to dishes throughout the holiday season. 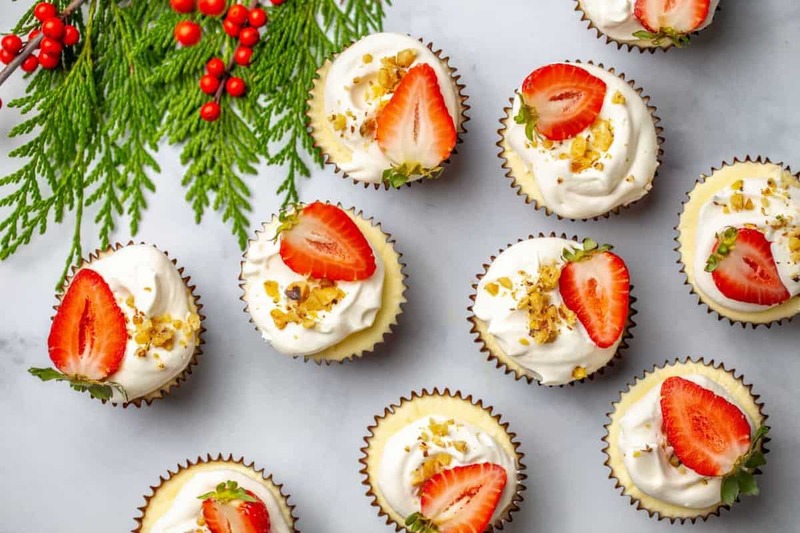 Low Carb Mini Cheesecakes are great for holiday parties because you don’t have to worry about dividing a full-size cheesecake into just the right number of perfect slices. They’re already pre-portioned so that guests can grab them when they’re ready to dive into dessert. 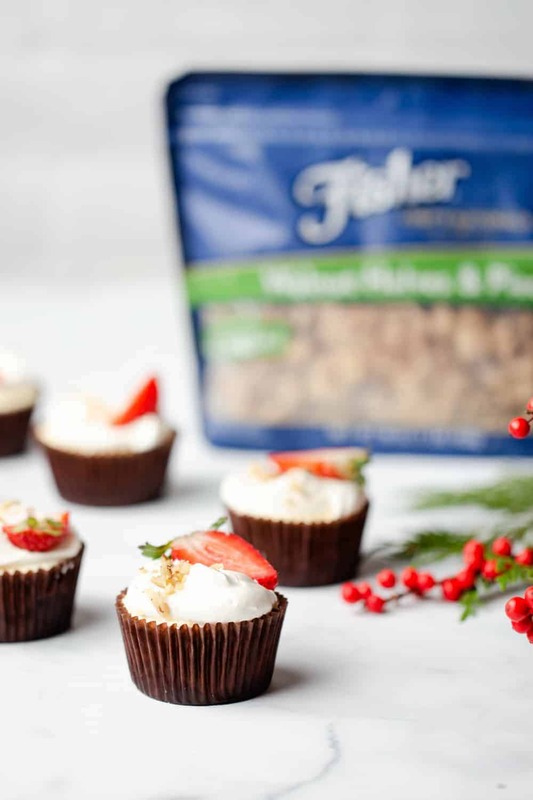 To make Low Carb Mini Cheesecakes, start by pulsing the Fisher® walnuts in a food processor until they form a fine crumb. Make sure not to over-process, or you’ll end up with walnut butter – which is delicious, but not what we’re going for here. The walnuts get mixed with some sugar substitute and butter before dividing the mixture into paper cupcake liners in a standard cupcake pan and baking. The liners will make it easier to pop the mini cheesecakes out of the pan later, so don’t skip them! Making Low Carb Mini Cheesecake filling is pretty similar to our other cheesecake recipes. Just make sure to start with room temperature cream cheese and add the eggs one at a time. I like to use a large cookie scoop to evenly divide the cheesecake filling into the cupcake liners without making a mess. I’ll take any tips and tricks that keep me from getting cheesecake batter everywhere. 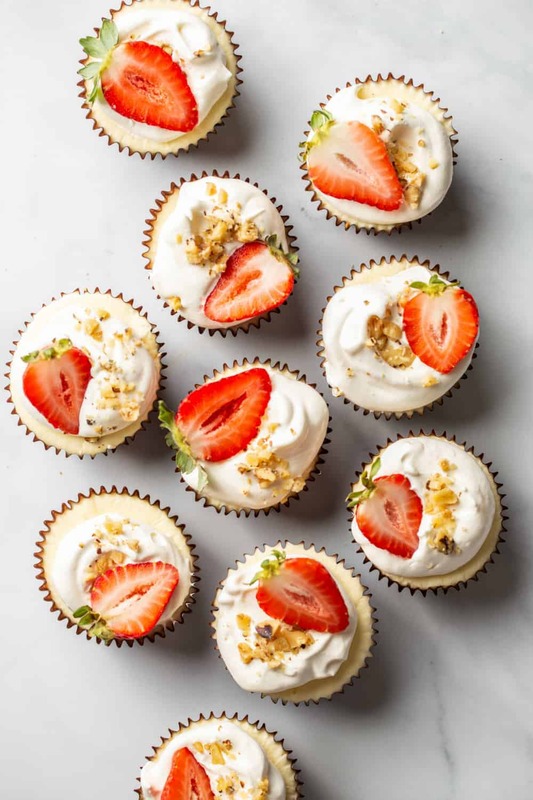 To top the Low Carb Mini Cheesecakes, I like to use freshly whipped cream, halved strawberries, and a sprinkle of finely chopped Fisher® walnuts for a little added texture and to let guest know what is in the crust. Looking for more low carb cheesecake recipes? 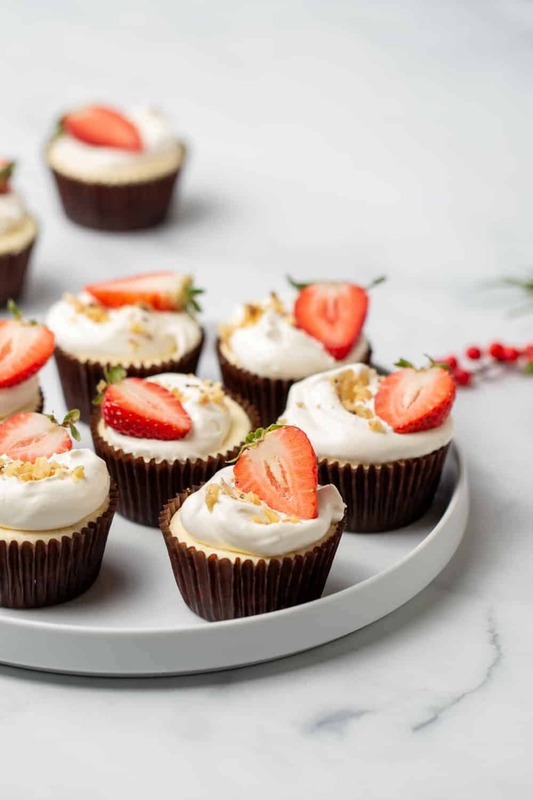 Check out Italian Lemon Ricotta Cheesecake, Low Carb Chocolate Truffle Cheesecake, or Low Carb Blackberry Cheesecakes from some of my fellow bloggers! 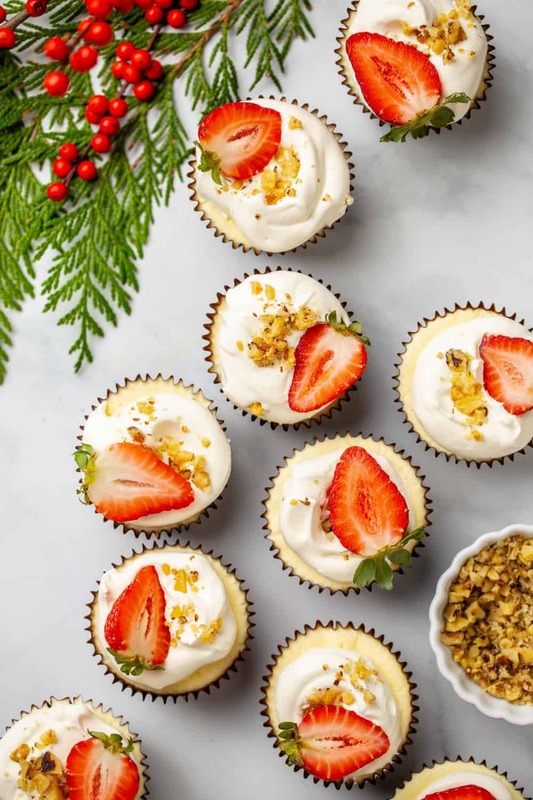 Whether you make these for yourself or your company holiday party, Low Carb Mini Cheesecakes are a special treat that everyone will enjoy. Preheat oven to 350 ̊F. Line a standard cupcake pan with paper cupcake liners. Place walnuts into the bowl of a food processor fitted with a metal blade. Pulse until they form a fine crumb. Add sugar substitute and melted butter and pulse until all the ingredients are evenly distributed. Place a heaping tablespoon of the crust mixture in the bottom of each baking cup. Press gently to form an even crust. Bake crusts in preheated oven for 5 minutes. Place pan on wire rack to cool while you prepare the filling. Beat cream cheese and sugar substitute in a large bowl of with an electric mixer until well mixed. Add eggs in one at a time and mix until incorporated. Scrape the sides of the mixing bowl and add in vanilla bean paste. Beat until incorporated. Use a large cookie scoop to evenly distribute the filling into baking cups. Bake for 15-17 minutes or until just set. Place pan on a cooling rack to cool completely. Chill in refrigerator for at least 2 hours. Just before serving, top with whipped cream, finely chopped walnuts and fresh berries.